Starting from our Railway Carriage at Seven Meadows Road, The Stratford Greenway is a 5 mile, disused railway line which Warwickshire County Council in partnership with Sustrans have transformed into a traffic free foot/cycle path. Starting at the cycle centre at Seven Meadows Car Park on the West side of town and heading out along the river, it travels along the River Avon and the Racecourse towards the nearby villages of Long Marston and Welford on Avon. There is also now an extension through Meon Vale making the route 6.5miles. Ouraddress is: Stratford Greenway Carpark, Seven Meadows Road, Stratford upon Avon, CV37 6GR. The route is part of Sustrans National Cycle Network Route5 and as well as the cycle centre the Carriages34644 cafe next door along with Carriages5344 Cafe halfway along the Greenway are perfect refreshment stops. 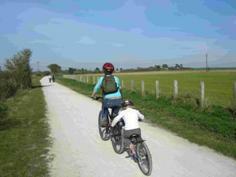 Return along the Greenway which is great for young families or people regaining their cycling confidence. There are also number of cycling routes from the end of the Greenway which also have some great pubs to stop by for a quick rest or a long lunch. We can provide maps and a number of the routes are signposted. 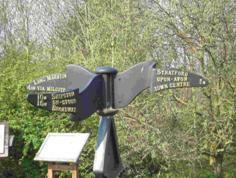 The Masons Arms - Just off the Stratford Greenway in long Marston. Just call to reserve your bikes and pick them up from the Carriage.